Biodiversity is the backbone for Agriculture, Aquaculture, Animal Husbandry, Forestry and a host of other applied branches of Biology. Hence, it stands at the very foundation of development, especially in a rapidly changing world. Population growth has not declined to a desired level. Soil quality has already started deteriorating the world over. There is very little unplanted arable land left for further agricultural exploitation. Hence, new varieties of useful plants and new breeds of domesticated animals have to be constantly evolved for increased yield, desired lifetime, disease resistance etc. For example, by 2020, world demand for rice, wheat and maize is projected to increase by ~ 40% and livestock production by more than 60%. Such an effort to increase the quality and quantity of bioresources is possible only if we have adequate information and knowledge about their wild relatives, which form the genetic source for their further improvement through the biotechnological methods. 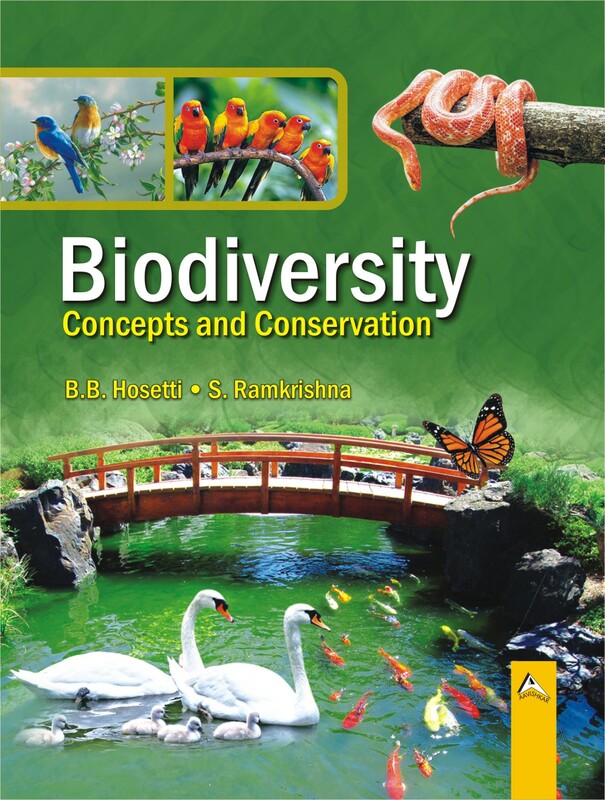 The book Biodiversity : Concepts and Conservaton includes chapters on biodiversity and conservation strategies for various groups of organisms. The basic concept, what is biodiversity and its importance to humans is narrated in chapter one. Basic elements of hydrobiology and Ramsar wetlands are provided in chapter 2. The first Ramsar convention was held in the year 1972 in Ramsar city in Iran. In that convention it was discussed about the conservation of wetlands for the protection of aquatic birds. This aspect was contributed by Prof. Ramakrishna from Bangalore University, Bangalore. Chapter 3 deals with the conservation strategies for the coastal migratory wetland birds of Karwar district, Karnataka. This chapter is contributed by Prof. V.N. Naik and Roshan T. from Post Graduate Centre of Karnatak University, Dharwad. The butterfly and plant diversity of Daroji wildlife sanctuary, which is located in the arid scrub jungles of Ballary district is described in chapter 4. Prof. Muniswamy David and his team from Karnatka University have studied the fish abundance with reference to Indian perspective (chapter 5). Ischthyofauna of freshwater ponds of Shimoga area are studied by Prof. Venkateshwarlu and Prashant Kumar (Chapter 6). Prof. Usha Anandi and Mr. Sharat have jointly reported the abundance of ornamental fishes in the Adda Hole of Western Ghats in chapter 7. Awareness and conservation strategies for snakes of Midwestern Ghats are provided by Dr. Jagadish in the last chapter No. 8. This book with different aspects of biodiversity will help to decipher the knowledge and conservation of biological diversity in India.